Hey kids, Father’s Day is around the corner ( June 19th) so be prepared to honor thy Father. Without Dads, you kids wouldn’t exist. And there are good Dads, Great Dads, and not-so-great Dads. Father’s Day might be a time to reinforce how you feel about Pop, or maybe mend a fence or two. And for a gift, give him something HE wants, not something YOU want to give. Cheers! 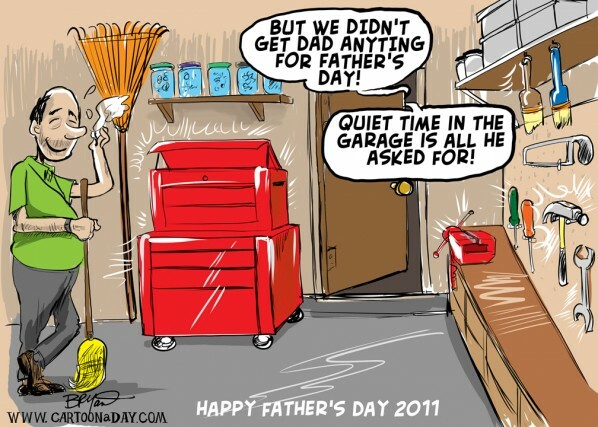 Inspiration: A Father's Day 2011 cartoon showing Dad enjoying some quiet time in the Garage. Some Dads love organizing their tool collection.